Abstract. The social and welfare development of rural areas is a challenge for Western Balkan countries. The rural development policies have an increasing relevance for the policy makers. The recent analyses in the three Western Balkan countries (Macedonia, Serbia and Bosnia and Herzegovina) reveal a low level of application of the measures aimed for improving the quality of life in the rural areas and maintaining the environment. It raises questions for researchers to find the reasons behind and options to improve the successful application of rural development policies. The goal of this research is to support the socio-economic development in rural areas by understanding the motivational factors behind the behaviour of rural population, and the influence of formal and informal networks. The theory of planned behaviour and social capital theory are used to explain the different patterns of behaviour and networking of rural population. A direct survey in November-December 2014 covered 900 farm households in Macedonia, Serbia and Bosnia and Herzegovina. The analysis is carried out by principal component and social network analysis. These findings serve as a basis for recommendations, for both the policy makers and the local communities, in order to increase the effectiveness of the rural development policy and ultimately mitigate the social disparities. The development of rural areas poses a challenge for Western Balkan countries. The trend of intensive migration from rural areas puts an additional pressure on the existing social and welfare disparities among urban and rural population. Political instability, wars and ethnic conflicts have slowed down the structural reforms and their progress in the European integration process. The countries face different political and economic circumstancesand are at different stage in the EU accession process. Due to harmonization of the national agricultural policy towards Common Agricultural Policy (CAP) of EU, rural development policies have an increasing relevance for the policy makers. However, recent studies (Volk et al., 2014; Bogdanov and, Rodić2014; Bajramović et al 2014) show that agrarultural policy in all of them isstillmuch more oriented toward production support, while funds intended for rural development are low and unstable. In addition, a large number of farmers, as majority of the rural population, are not familiar with the measures and mechanisms of support for rural development, and a significant number cannot meet the administrative requirements (e.g. evidence proving property rights, collateral etc.). In the previous experience of establishing the EU Instrument Pre-Accession Assistance for Rural Development (IPARD),insufficient preparedness of farmers and institutions to meet the provided rules has resulted with a low rate of utilization in the initial years.The absorption capacity can be improved by supporting farmers in their intention to improve the farm capacities, enhance the environment and the rural economy. Furthermore, establishing and maintaining effective institutional frameworkcan contributetoexploitingthe opportunitiesandproviding a more dynamic restructuring of the sector. Social psychology provides a suitable conceptual frameworks and methodological tools to understand farmer behaviour and design interventions to support a behavioural change. The theoretical framework used in designing interventions is one of the key features determining its impact on behaviour change (in line with method and mode of delivery). Although TPB (Ajzen, 1991) is not a theory of behaviour change, according to a meta-analysis of Webb and Sheeran (2006), it is among the most frequently used theories for changing behavioural intentions. The theory identifies the determinants of the intention (attitudes towards the behaviour, subjective norms and perceived behavioural control) and their relative contributions to prediction of intentions and later in behaviour occurrence. One way to initiate a behaviour change is by motivating people to engage in behaviour (in case of a lack of intention).Intentions can be modified by changing the major determinants of intentions or by changing their relative weights. This motivation can be performed presenting information to guide formation of new beliefs, rather than changing the existing beliefs (Ajzen 2011). Due to various factors that weaken the relation between intentions and behaviour, prediction of behaviour is more difficult. Once an intention is formed, the second stage in the behaviour change intervention is to close the intention-behaviour gap, by helping them to overcome obstacles to perform the behaviour (increasing behavioural control). For doing so, it is important to identify the internal and external factors that form the control, so to design an assistance to provide individuals with the required self-esteem, tools and resources (trainings, networks, etc) to encounter unanticipated difficulties and gain actual control over behaviour performance. In terms of networks, institutional economics analyse the relations between actors and not the actors themselves. In most cases, network arise as informal mechanism of coordination, based on individual interaction and restricted to limited groups with related interests (Thomson 2003). Social capital measures the level of trust and recently has been recognized as a new production factor for stimulating economic growth (Chloupkova et al. 2003). Higher the social capital, the better access to resources (Bian, 2008). In addition, the social capital positively influences the transfer and quality of information. Timely and accurate information is important for timely and proper knowledge for the RD applications, as well. Therefore, understanding how informal networks are organized and structured, might give an idea how to use such model in stimulating formal networks. Most of the research concerning rural areas in the Western Balkans in the past few decades is general, descriptive and based on comparisons of the demographic, economic, social and political changes in the rural areas. For that reason, the overall goal of the project is to support the socio-economic development in rural areas by increasing the absorption of the RD funds and increasing the economic networking of farmers; thus increasing the effectiveness of the rural development policy instruments. For that reason, the project defines two distinct objectives: (1) to understand personal motivational factors and barriers of rural population to apply to RDP; and (2) to understand the informal networks organization and structure.Hence, the conceptual structure of the project is multi dimensional. The first dimension is the personal level of behaviour, analysed by the Theory of Planed Behaviour. The second focuses on the interpersonal relations among farmers, studied by the Social Network Analyses. Socio-economic characteristic and social pressure is the intercept point between them. The third dimension is the cross-country comparison among Macedonia, Serbia and Bosnia and Herzegovina. The complex objectives require dual approach to fulfilthem. In that regard, the theory of planned behaviour (TBP) approach is used as the conceptual framework for understanding farmers’ intentions to apply for RD programs, and the Social Network Analysis (SNA) is used to mapfarmers’relations in terms of sharing information regarding the RD policy. Therefore, the data collection is performed with a specificallydesigned questionnaire to meet the requirements of both approaches. The questionnaire contains three major parts: Rural development program, Network and organizations, and Farmer and his household. The first part is focused on the farmers’ awareness of availability of RD measures and their past experience (since 2011),and a list of statements to reveal the constructs of TPB approach. These statements are measured on a 5-point agree-disagree and Likert scale, given in a semantic differentiate format, ranging from 1 (totally disagree or the worst evaluation) to 5 (totally agree or the best evaluation).The secondpart is focused on farmers’ membership in organizations, main reasons for cooperation and for not being a member of any organization. This part contains a Name generating table, which is a SNA specific tool for gathering relational data; by nominating people they communicate the most regarding the topic of interest, with additional background information regarding their nominees. The third part concerns farmer attributes and characteristics ofthe household and thefarm, used as background information for both approaches. The survey took place in November-December 2014 in Macedonia, Serbia andBosnia and Herzegovina, including about 300 farm households per country in two different sub-regions in each country, or in total 895. The selection of the regions and farm householdsis made on a few previously defined criteria. Regions are selected at the municipality level, as the lowest territorial units for which there are official statistical data to ensure compatibility of administrative units within eachregion. 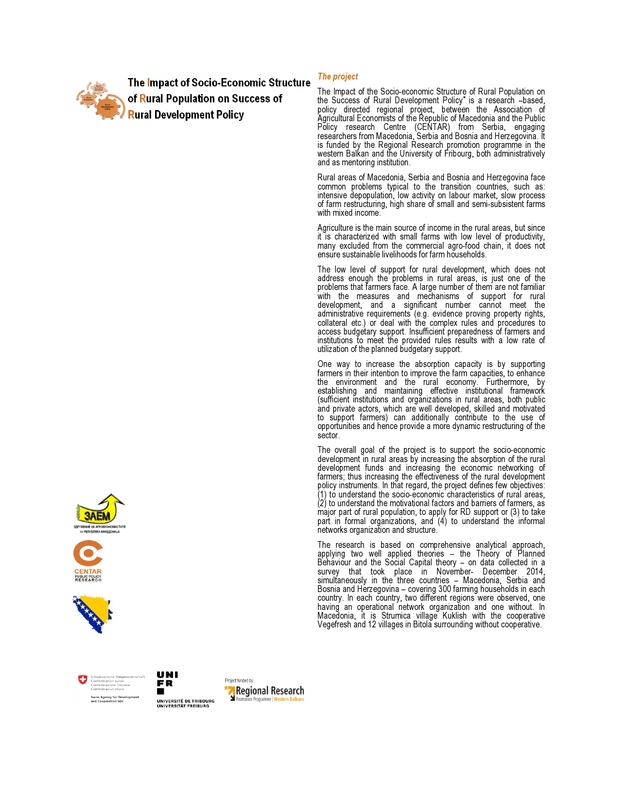 The existence of operational institutionalized form oforganizationis a noticeable difference between sub-regions.On the household level selection is based on the criteria of national statistics to be classified as a farm household and thus to be qualified as beneficiaries of agriculture and rural development support, from one side; and in order to cover demographically viable and to avoid single-member and elderly households, only thosewith a least two members, out of which at least one is younger than 50 years are included. Due to different circumstances in each country, the form of network in each country slightly differs. Hence, in Macedonia the region with an existing network organization (ENO) has a operational cooperative (Strumica); in Serbia it is a region with regional and local producer associations, cooperatives, chambers of commerce, SMS in agri-food sector (Kragujevac); while in Bosnia and Herzegovina, itis a the region with an agricultural incubator (Zhepche). The counter-part region is without an existing network organization(NNO) (Bitola, Aleksandrovac and Visoko,respectively). Data analysis.All TBP statements were presented on an ordinal scale, therefore, the difference between countries and regions were determined with non-parametric tests (Kruskal-Wallis test and Mann-Whitney test as post hoc procedure). Principle components analysis (PCA) was used to identify the latent underlying structure among the statements regarding the RDP.Standard criteria for examining the factorability and adequacy were used (Kaiser-Meyer-Olkin measure of sampling adequacy (value over .8), and Bartlett’s test of sphericity (p=.000). The missing values were imputed using the maximum likelihood method with expectation–maximization algorithm. The items with communalities over .5 were retained. The number of factors was determined using parallel analysis, using a random set of eigenvalues, and the solution was further confirmed by the visual scree test and the Kaiser’s eigenvalue-greater-than-one rule. The minimum amount of required observations for factor analysis was satisfied, with a final aggregate sample of 895 observations (using pairwise deletion), hence providing around 12 observations per variable on country level. In order to get interpretable factors, orthogonal Varimax rotation was applied. The social network data are collected from each respondent covering their personal perception of relation to others.The collected data was coded in anadjacency matrix (NxN in terms of number of nodes, where 1 is assigned to existing relations and 0 otherwise).Those directional ties between the nodes provide information on the farmer’s informal cooperation and its effect on the level of RDP application (Lin, 2005; Wasserman and Faust, 1994). The coded data is analyzed in the specialized software tool UCINET (Borgatti et al., 2002). Different cohesion measures (density, reciprocity,betweeness)quantify the social capital and trust through the network structures, while sociograms provide visual presentation of them (Borgatti et al, 2012). The average age of farmers is over 45, with a high variation within the sample. Most of the farmers are with low level of education, but with long experience in farming. Farmers in Macedonia (MK) are almost solely relying on agriculture, while in Bosnia and Herzegovina (BA) and most notably in Serbia (RS), many of them have additional household income from other sources. The farm sizes are small, especially evident in the Bosnian sample. It is highly likely that the farmers will stay in agriculture, though most do not know who will take over their farm and continue the farming activity. Farmers’ general attitude towards cooperation is negative. This is seen in the very high percentage of farmers which are not members in any institutionalized form of cooperating organization. They do not find membership in organizations useful, and think that these organizations do not provide assistance in the process of application for RDP. Furthermore, they see other people in organizations looking only for their own interest, which additionally burdens their cooperative attitudes. The number of farms that applied and received rural development support and the average amount received per farmer is different among the country, hence reflecting the different level and availability of rural development measures. Namely, in Serbia 8% of the farmers applied for RDP support with 84% success rate and received in average 2,510 Euros; in Bosnia and Herzegovina 37% applied, 55% of them were successful and received in average 1,250 Euros; and in Macedonia, although comparatively highest support of 5,600 Euros per farmer, only 25% applied with 65% success rate. In general, farmers in all countries are either positive or neutral in their individual intention to use RDP in short term (in one of the next calls) and mid-term time-frame (in the next 3-5 years). Their intention, however, to participate in projects for common interest for development of the village area (e.g. infrastructure, irrigation systems etc) is less enthusiastic and to most extent neutral. The analyses do not give the relative contribution of each construct on the intention, but gives an illustration of the constructs and their content. The analysis of the RDP opinion statements showed significant differences among countries (p<.05), where the Macedonian sample differs mostly from the other two countries.An explanation might be that only Macedonia has a specific RD program (with an EU harmonized institutional organization, in terms of programming and implementation). The farmer’s attitude to RDP in Serbia and Bosnia and Herzegovinaare similar, with some statistically significant difference in subjective norms and perceived behavioral control. PCA yielded four components in the case of Serbia and Bosnia and Herzegovina and five components in the case of Macedonia (Table 2),explaining the variance with 71.15% in Macedonia, 65.42% in Serbia, and 70.31 in Bosnia and Herzegovina. The factors were synthesized into three logical sets, in line with the applied TBP conceptual framework: farmer’s attitudes, subjective norms and perceived behavioral control with one particularity -the attitudes and perceivedbehavioral control are split in two groups (ones related with personal benefits and abilities and others with public benefit and external barriers). The attitude about the benefits is positive, with over 90% of farmers stating that it is good to have a RDP. Most farmers recognize the role of RD measures in supportingthe survival of family farms and improvementoffarm income. The general attitude towards the existence of such measures is strongly positive (Macedonia 4.56±0.595; Serbia4.36±0.666; Bosnia and Herzegovina 4.17±0.933). Regarding the otherattitudinal statements, Bosnian andSerbian farmers are positive or neutral (Table 3). Macedonian farmers have much more positive evaluation of the personal benefits (increasing farm income and survival of small farms), than the public benefits (protection of environment, closer networking, improvement of infrastructure, and implementation of EU standards). It shows the lower knowledge of Macedonian farmers about theobjectives and thus the potential outcome of RD policy. The principle of co-financing, which is present only in the Macedonian program, and thus in the MK sample, is evaluated positive (3.73±1.098). Farmers value the opinion of their family and other people they respect.Family support is evaluated the most in Bosnia and Herzegovina (4.27±0.831), and the least, but yet positive, in Serbia (3.97±0.960). The support from others is evaluated as neutral to positive (from 3.59±0.989 in Macedonia to 3.77±0.742 in Bosnia and Herzegovina). The question whether the farmer decides to apply for RDP independently isto measure the degree of influences of important others on the decision-making(although not being a straight-forward formulation of subjective norm). In Macedonia this decision is often shared, while in Serbia and Bosnia and Herzegovina it is the farm holder that decides. The confirmed importance of thesocial approval and supportshould be used as a supplementary promotional strategy contributing to the RDP success. The identification of person(s) through the social network analysis that are of central role to the farmers village environment can act as “agent of change” or a “village leader”. Such person(s) who is widely respected by the peers can facilitate the promotion of the program in order to motivate and support the others to apply to RDP. RDP leads to improvement of the infrastructure in rural areas. RDP leads to protection of environment, local breeds and varieties. RDP leads to higher implementation of EU standards. RDP leads to higher networking of rural population. RDP leads to stronger development of rural tourism. RDP supports the survival of small family farms. RDP increases the income of the farms and rural households. The principle of co-finance in RDP projects is good motivator for farmers. In general, I think it is good that the state has a RDP. The decision whether to apply for RDP is totally up to me. My family approves the application for the RDP. Other people I respect approve the application for the RDP. Many people I know pursues me to apply for the RDP call. The RDP application (procedure and documents) is easy. The preparation of the RDP application is not expensive. The information regarding the RD program is easy to get. My knowledge and experience is enough to independently prepare the application (procedure and documents). I have enough own means to co-finance an RDP investment. I am able to get bank credit to co-finance an RDP investment. The personal ability and the control over information, knowledge and experience to prepare the RDP application are generally assessed as impediment. Regarding the personal abilities, Macedonian famers have more control but face more external barriers. Serbian farmers have less control over all aspects, while Bosnian farmers have strong self-confidence.Applications in Macedonia are evaluated as easily accessible and not expensive, which in practice are supported by the extension services, and free of charge. A contrary those attributes are evaluated less positive in Bosnia and Herzegovina. Regarding the personal ability Macedonian farmers are less self-confident, while Bosnian and Serbian are neutral.The farmers, especially in Macedonia, find their experience and knowledge not enough to independently prepare the application (also evidenced in Kotevska et al., 2013). Farmers in the other two countries are more neutral and confident to this issue. In addition, Macedonian farmers have less own means to co-finances such investments, but the least access to finances. Consequently, the need for supportis evident, both in terms of preparation and administration of RDP and access to finances. It will encourage them to use the RDP and help in the co-financing requirement for participation in RDP.In this context, it is imperative to develop mechanisms to support farmers in overcoming these barriers. The policy measures need to become accessible and applicable by providing continuous simplification of the application procedures. The extension support needs to be intensified (for example, “one-stop-shop” for documentation issuing). A free and easy access to beneficiary database need to be developed, as well as mechanisms to prevent corruption, which was also recognized as an issue. The last but not least, the farmer’s self-confidence should be continuously built up, by well-defined trainings and education through “lessons learned campaigns”. The differences in data collection resulted in different types of networks. In Macedonia, because of the existence of partial farm lists, a whole network approach was possible. This was not the case in the remaining countries, and the open networks were applied instead. This approach provided certain complexness of the information by including and identifying more nodes (actors) in the networks with which farmers discuss RDP issues. This also results in higher fragmentation and number of components, larger diameter and less closure of the network. The visual presentation of networks is important since they often reveal the network structure better. In Macedonia, the network visualization reveals the grouping of farmers and the importance of the managers of the cooperative (the largest nodes) for the diffusion and access to information regarding RDP (Figure 1). Rural development programsoften requireimplementation through strong community coordination and efficient share of knowledgeandinformation. Informal information networks regarding RD Programs are present and functional in all three countries, however are mainly of the bonding (close kin or friend) type. The network data reveals high network fragmentation, but regardless of this fragmentation, information is transferred relatively fast through the networks (e.g. Bosnia and Herzegovina 2.4 to 2.6 steps from one node to another). The cultural, historical and local context often shapes the structure of social capital, and levels of trust (Granovetter 1985, 1992). 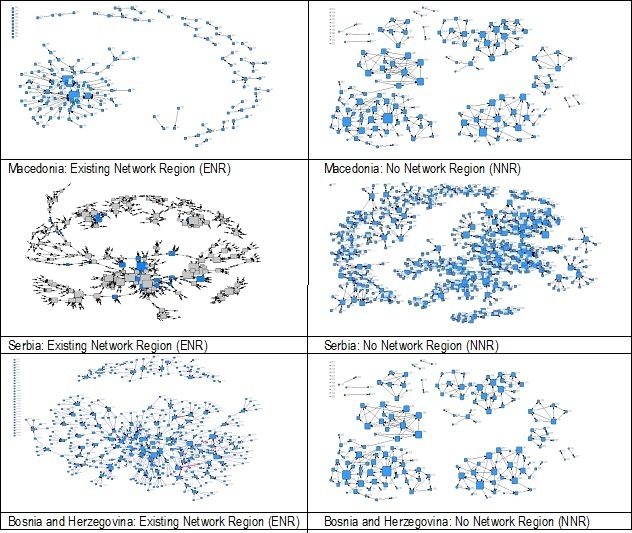 Network cohesion measures indicate to low levels of social capital and trust, not showing large differences between the sub-regions (Table 3).The average number of ties that farmers have is around 2, and the reciprocity of ties (ties that go in both direction), which provides information exchange and reflects on mutual trust is also small. This confirms the presence of informal networks as an efficient channel for information sharing and access to resources. Although farmers are applying and have intention to apply for RDP, they do not perceive membership in organizations as useful medium for this purpose. In addition, a high share of farmers avoids membership in any type of institutional (official, governmental) organization. As a main reason might be the strong distrust towards other members of organizations and their interests. Besides the apparent general distrust towards other people’s intentions, there is also a perception of corruption related to RDP procedure. This can be interpreted in the sense that the application for RDP does not mean approval as such. The distrust in institutionalized and governmentally stimulated forms of socio-economic cooperation, often present in the post-socialist countries, largely impedes the development of rural areas. The project providesevidence-based understanding of the farmer behaviour and their interpersonal relation with other farmers. It confirms the general attitudes of farmers regarding the RD measures as neutral to positive; but there is a space for action to further intensify them. It identifies the lack of abilities (knowledge) that need to be addressed by training and "lesson learned" campaign. In addition, it reveals certain external obstacles, which need to be mitigated by governmental actions, and thus encourage farmers to perform the behavior. Due to the importance of others for the farmer, networks analysis should identify the potential ‘agents of change’ and promote the desired behavior. The SNAreveals the informal social networks’ structure and, the way of their functioning through the main features of social capital.There is a low social capital in all three countries and functional informal information networks. Still, underdeveloped and low level of social capital limits the functionality of information systems and the access to RD related information. In order to initiate stronger progress and development of rural areas, a model that will facilitate cooperation among farmers is necessary. In that regard, mapping of informal network patterns can help in better understanding of the institutional organizations in economic systems with substantial disturbance and help in identifying the most proper structure. It may also contribute in identifying important individuals or actors which hold key positions in the networks in order to engage them as information brokers. This project fills partof the research gap on the factors that facilitate or hinder the farmer behaviour in the Western Balkan countries, in terms of their application to RD measures, or their formal networking as means providing flow of information and distribution of resources. It also reveals some aspects for further research studies. The findings could serve as a basis for recommendations, for both the policy makers and the local community, in order to increase the effectiveness of the rural development policy and ultimately mitigate the social disparities. Ajzen, I. (2011). Behavioral interventions. Design and Evaluation Guided by the Theory of Planned Behavior. In: Mart, M.M., Donaldson, S.I., and Campbel, B.C. (eds.). Social psychology for program and policy evaluation. Chapter 3, pg. 74-100. New York: Guilford. Bajramović, S., Nikolić, A.,and Butković, J.et al 2014). Agriculture and Agricultural Policy in Bosnia and Herzegovina.In: Volk, T., Erjavec, E., and Mortensen, K. (Eds.). Agricultural Policy and European Integration in Southeastern Europe. Budapest: Food and Agriculture Organization of the United Nations. Bian, 2008 Bian Y. (2008) The Formation of Social Capital among Chinese Urbanities: Theoretical Explanation and Empirical Evidence. Social Capital-An International Research Program. Eds. Nan Lin and Bonnie H. Erickson. Oxford University Press. UK. Bogdanov, N., and Rodić, V.(2014). 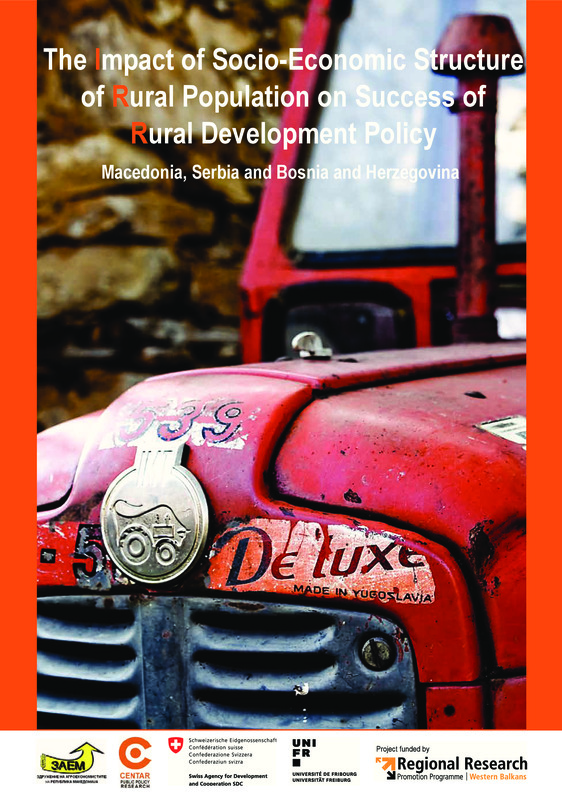 Agriculture and Agricultural Policy in Serbia.In: Volk, T., Erjavec, E., and Mortensen, K. (Eds.). Agricultural Policy and European Integration in Southeastern Europe. Budapest: Food and Agriculture Organization of the United Nations. Borgatti, S. P. (2002). NetDraw: Graph Visualization Software. Harvard: Analytic Technologies. Chloupkova, J., Svendsen L. H. G. and Svendsen, G.T. (2003). Building and destroying social capital: The case of cooperative movements in Denmark and Poland. Agriculture of Human Values, 20, 241-252. Dimitrievski D., Kotevska A., Janeska Stamenkovska I., Tuna E., and Nacka M. (2014). Agriculture and Agricultural Policy in the Former Yugoslav Republic of Macedonia.In: Volk, T., Erjavec, E., and Mortensen, K. (Eds.). Agricultural Policy and European Integration in Southeastern Europe. Budapest: Food and Agriculture Organization of the United Nations. Lin, N. (2005). A Network Theory of Social Capital. In Castiglione, D., Van Deth, J. &Wolleb, G. (Eds.) Handbook on Social Capital. Oxford University Press. Murray, C. (2006). Social Capital and Cooperation in Central and Eastern Europe, Towards an Analytical Framework, Poster paper presented at the International Association of Agricultural Economists Conference, Gold Coast, Australia. Thompson F. G. (2003) ”Between Hierachies and Markets-The logic and Limits of Network forms of Organization”, Oxford University Press. Volk, T., Rednak , M. and Erjavec, E.(2014). Cross country analysis of Agriculture and Agricultural Policy of Southeastern European Countries in Comparison with the European Union.In: Volk, T., Erjavec, E., and Mortensen, K. (Eds.). Agricultural Policy and European Integration in Southeastern Europe. Budapest: Food and Agriculture Organization of the United Nations. Wasserman, S., & Faust, K. Social Network Analysis. 1994. Cambridge University, Cambridge. Webb, T. L., & Sheeran, P. (2006). Does changing behavioral intentions engender behavior change? A meta-analysis of the experimental evidence.Psychological bulletin, 132(2), 249. Workshop on "Producing Policy Relevant Analysis & Writing to Influence Decision Making"
RRPP News: Preliminary Results of the Project "Implementation of the Social Science Research Results in the Policy-Making Process"
RRPP News: Policy Brief "Towards Better Prospects for Young Researchers in Social Sciences in Serbia"
EC published final report of the project "Mainstreaming climate change into rural development policy post 2013"
RRPP News: "Why don’t our graduates return to Serbia?" published in Serbian newspaper "Danas"
RRPP: Science, Research and Prosperity – where is Switzerland positioned in European/World Science?